✔SPECIFICATION & FUNCTION: 10 Feet HDMI a male to a male Cable, Supports Ethernet, 3D, 4K video ,Audio Return Channel (ARC) and all HDMI 2.0 functions. Resolutions up to 4Kx2K (UHD) including 4096x2160, 3840x2160, 2560x1600, 2560x1440, 1920x1200, and 1080p.Combines HD audio & video (up to 2160p) into 1 cable for many home theater needs. 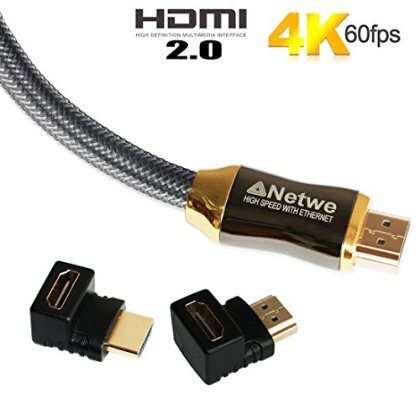 ✔SATISFACTION WARANTY: Netwe HDMI cables are backed by a Limited Lifetime warranty. Please contact us via email if you have any questions or concerns.